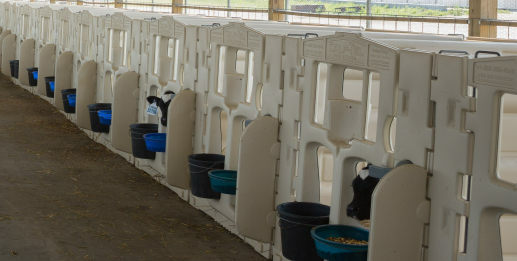 These plastic indoor pens provide flexible accommodation for keeping calves in an open, well ventilated shed. 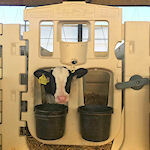 The calf pens are produced using the same process and material as Calf-Tel hutches making them both strong and durable. 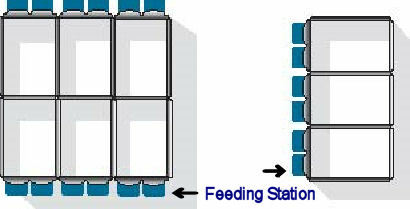 The diagram below shows a typical layout of calf pens. The air max backs can only be used side by side as shown on the right. Pens are available in three different lengths as shown below. The 4'6" and 6' length pens are held in stock, the 7' pens and air max backs are available on special order. 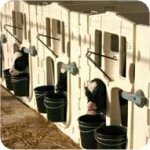 We use the pens in purpose-built, open-sided calf barns and they work well for us. See pictures of pens in use on farms across the UK.